Very many categories of repair work carried out in enclosed spaces and associated with the installation of such building structures as door and window blocks, provide for the mandatory sealing of the latter. To seal the existing joints, a special tool is used to fill them with assembly foam. 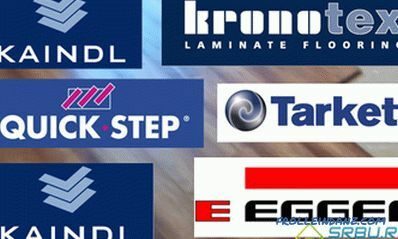 In this article, you will be able to get acquainted with how to apply the foam to the interface, in need of reliable sealing. 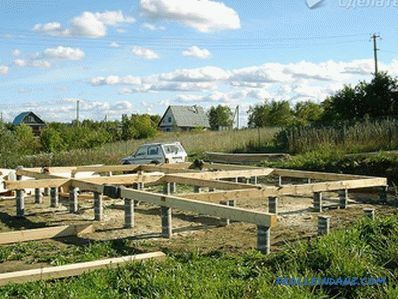 Before starting work, you must carefully examine the place supposed compaction, and then thoroughly clean it from dust, debris, stains and other contaminants. After cleaning the working area, it should be moistened with water; at the same time you can resort to the help of a spray gun. 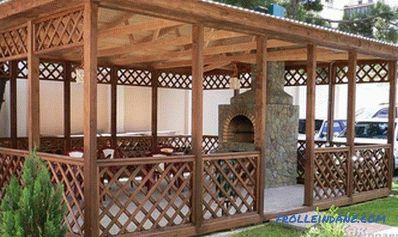 The fact is that after moistening the articulation surface, the assembly foam interacts with it more actively and increases in volume more quickly. In addition, before starting work it is recommended to heat the cylinder to plus 20 degrees Celsius, which can be done by simply lowering it into a container with water heated to this temperature. Each time before pouring foam, it is necessary to vigorously shake the container so that its contents can mix well and acquire the necessary consistency. Cylinders have a built-in atomizer with a tube for directing the flow of foam. 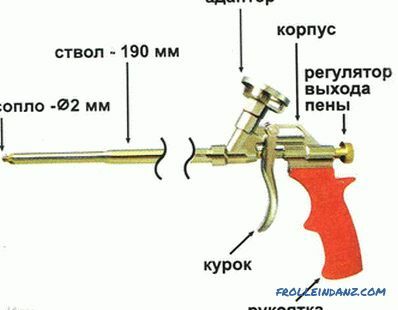 In contrast, professional foam application involves the use of a more complex mechanism - the so-called assembly gun with a special nozzle for the cylinder. When handling a balloon, just direct the tube to the desired location and immediately start spraying. 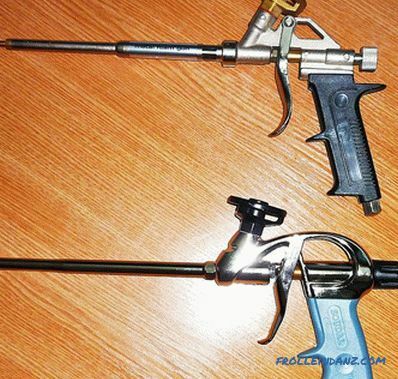 When using a professional tool (pistol), it is necessary to install a cylinder on it and fix the adjusting screw in the position of the most effective foaming. You can adjust the intensity of foam release with the same screw or by changing the force of pressure on the start lever. 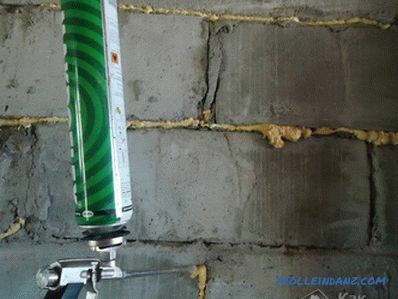 Foam is applied by smoothly moving the nozzle of the spray gun, carried out in such a way that a smooth strip is formed that fills the slits at half their depth. 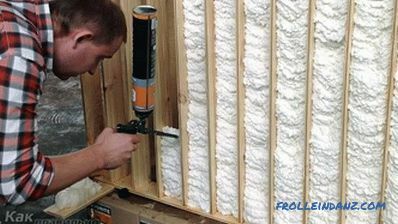 Immediately after application, the foam will begin to expand and fill all available voids. 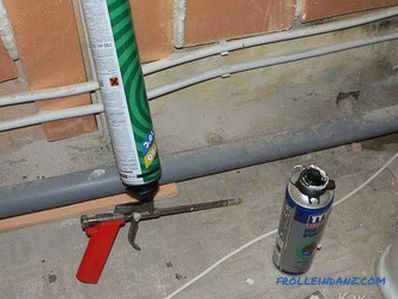 During the replacement of the used cylinder the installation slot It is recommended to lubricate the pistol with a special compound that removes all foam residues. When installing the door unit, foam should be filled only with the mating on the side of the wall partition. The gap from the box side is best sealed with silicone sealant. 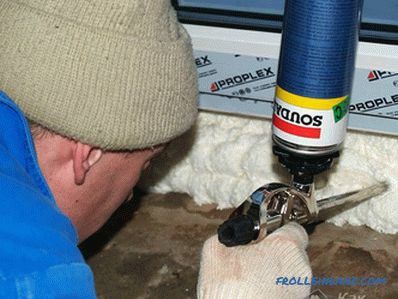 Before you apply the mounting foam to the sealing area in winter, you need to remove the remnants of ice and frost from the surface. 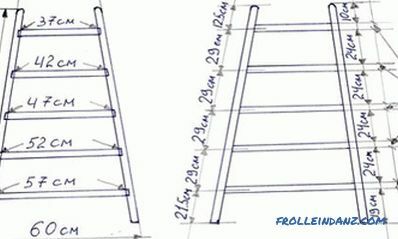 Surplus material is removed in the simplest way, that is, cut with a knife. If you sprayed with foam during the application of the material glass windows, then the traces of it can be washed off using a special liquid or acetone. It is not recommended to process the foam until it finally “grabs”, as this can slow down its hardening and lead to changes in the density of the material. In the intervals between gun inserts, the foam bottle should be placed vertically.